Amstelhof, a monumental classical-style building facing the Amstel River in Amsterdam served as a retirement home for seniors beginning in 1692, and in 2004 it became an outpost of the Hermitage Museum. On June 19, 2009, Queen Beatrix of the Netherlands and Dmitry Medvedev, President of the Russian Federation, opened a $50 million renovated state-of-the art museum with a stunning exhibition. The Hermitage Amsterdam is the first permanent branch of the Hermitage Museum in St. Petersburg. Temporary exhibitions will be chosen from the collections of the Hermitage and other less visited Russian museums for future venues. The Hermitage Museum in Amsterdam houses a remarkably diverse and exquisite collection of Russian art ranging from Karl Fabergé objects to gowns worn by the Tsarina Alexandra Feodorovna. Upon entering the first hall, one is captivated by tall glass cases displaying the extravagant and impeccably preserved wardrobes of cossacks, grand duchesses, and more. The reality of being so close to a delicate lace and silk gown once worn by Grand Duchess Tatiana was nearly impossible to grasp. An impressive assortment of paintings depicting the Winter Palace could easily have been mistaken for photographs with their tedious detail and life-like perspectives. Innumerable portraits, silver pieces, and even toys and books once enjoyed by the children of the Imperial family, the morning robe of Nicholas II and his wife, Alexandra Feodorovna, along with numerous shoes, parasols, fans, and handbags depict life of that era. The works of Fabergé were one of the highlights for us. 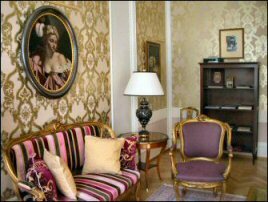 One could spend hours exploring each room and corridor with still not enough time left to admire the many deserving pieces. We are so grateful to have had the opportunity to visit the Hermitage Amsterdam Museum and would enthusiastically categorize it as a must-see for anyone who appreciates the treasures of Russia. Closing date is January 31, 2010. Catalogs in Dutch and English are available at the museum shop. In 2014, The State Hermitage Museum anticipates celebrating the 250th anniversary of its founding with the transformation of the East Wing of the General Staff Building – allocated to them by the Russian government – into a museum for 19th – 20th century art complete with a Fabergé gallery and research library. Catalog in Russian: Muntian, Tatiana, Шедевры Фаберже. 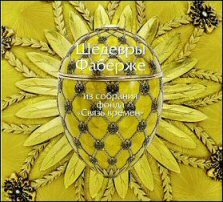 Из собрания фонда “Связь времен” (Fabergé Masterpieces from “The Link of Times” Collection), 2009. Additional interview details: The collection is kept in Sberbank (Ed. note: Central Bank of the Russian Federation) in between exhibitions; two more projects are the rebuilding of the Shuvalov Palace in St. Petersburg, and the construction of a museum in Moscow, both of which will showcase the collection. 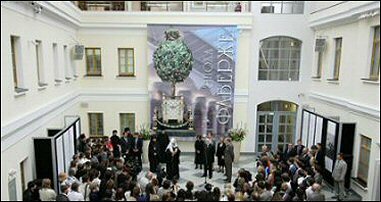 On May 9, 2009, Alexander Ivanov of Moscow, successful bidder of the 1902 Rothschild Clock by Fabergé for $16.5 million, opened a museum in the resort town of Baden-Baden, Germany. The Moscow Times, April 6, 2009, reports a 19th century four-story building to house the museum was acquired and renovated by Mr. Ivanov. It includes a €1 million security system. Exhibition presents objects from three centuries of Romanov rule with special emphasis on Russian art from the mid-18th century to the early 20th century. Fabergé eggs from the Vekselberg Link of Times Collection, and the Blue Serpent Clock Egg from the Collection of the Prince’s Palace of Monaco are on view. Catalog available in September 2009. Digital photos from the successful Homage to Carl Fabergé: Books – Design Studies – Photographs venue are available online. 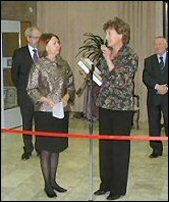 Shown in the photo above at the ribbon cutting are Irina Lynden, Deputy Director for International Affairs of the National Library of Russia in St. Petersburg, and Ulla Tillander-Godenhielm, lender to the exhibition. 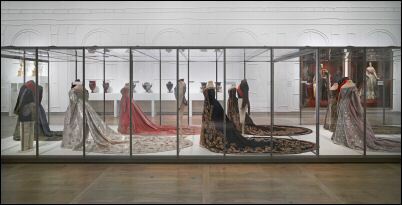 The Fabergé Gallery of the Virginia Museum of Fine Arts in Richmond is closed until May 1, 2010. Andrews, Isabel. “Collectors’ Focus.” Apollo, The International Magazine for Collectors, May 2009, 73-4. Author discusses the ‘enviably robust market’ at Fabergé auction prior to the worldwide economic downturn. 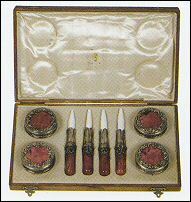 Sotheby’s New York (April 22, 2009) The Princess Gorchakov Fabergé silver toilet set did not sell. Sotheby’s introduced an e-catalogue searchable by medium, estimate or artist, and other features for its Russian sales, and reduced the size of the print catalog to 6½ inches square. Christie’s London (April 24, 2009) A Fabergé lily of the valley sold for $314,500. ‘Christie’s said there was competitive bidding from a diverse international client base. But purchases fell far short of recent years when billionaires splurged abroad to bring Russian art back home.’ Reuters News Service, April 25, 2009. Jackson’s International Auctioneers, Cedar Falls, Iowa (June 23-24, 2009) sold a Fabergé clock for $72,000. Previously unknown and private collection of about 100 lots – cigarette boxes and an extraordinary array of cufflinks, including many fine pieces of Fabergé. Objects have ciphers, Imperial inscriptions and coats of arms, and even photographs of the Grand Ducal Vladimirs and their immediate family. 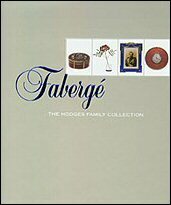 catalogue raisonné for the Objects of Desire: Fabergé from the Hodges Family Collection is now available from the New Orleans Museum of Art. Color images with accompanying text for each object in the collection are supplemented by the following essays: Discovering Historical Connections by Dr. Daniel L. Hodges as told to Christel L. McCanless, Carl Fabergé and Russian Money by Dr. Géza von Habsburg, Fabergé’s Work in Wood by Kieran McCarthy, and Fabergé and His Oeuvre by John W. Keefe. 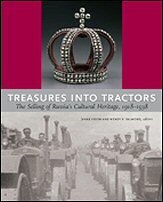 Treasures into Tractors: The Selling of Russia’s Cultural Heritage, 1918-1938 brings together for an English-speaking audience the current research of an international team of scholars who have investigated not only the motivations and preparations for selling art, books, and other cultural artifacts in Russian collections between World Wars I and II, but also how a market for Russian art and antiques was created in Western Europe and the United States and who the dealers and collectors were. Edited by Anne Odom and Wendy R. Salmond. 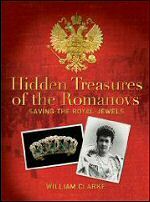 Following extensive research in St Petersburg, Moscow and Paris, William Clarke in his new book, Hidden Treasures of the Romanovs: Saving the Royal Jewels, reveals for the first time the story of Albert Henry Stopford, Edwardian man-about-town, member of the English aristocracy, dealer in objects d’art from Fabergé and Cartier, and a regular guest at Romanov dinner tables. In the terrible turmoil of the Russian revolution he risked his life, rescuing Romanov jewels from the Vladimir Palace worth millions of pounds from under Bolshevik noses, and taking back to Britain in his Gladstone bag gems that were destined to adorn the rich and famous. Ninety years later, as an intriguing postscript to this extraordinary story, the author unearthed an unclaimed Romanov bank account in London in the name of Grand Duke Andre; it has now been claimed by more than a score of his heirs. Toby Faber, author of Fabergé’s Eggs: The Extra-ordinary Story of the Masterpieces that Outlived an Empire (2008), wonders why Carl Fabergé over the years became known as Peter Carl Fabergé? Ulla Tillander-Godenhielm’s response to this question: A list of the names for all known members of the Fabergé family according to their birth certificates is in Fabergé ja hänen suomalaiset mestarinsa (Fabergé and His Finnish Workmasters) 2008, 18-19. It is not unusual for the calling name to come second. Peter Karl Fabergé was born on May 30, 1848. His Russian mark was for Karl Fabergé (Карл Фаберже); for the English market it was CF . I have always thought it was wrong to say Peter Carl for the same reason that I would find it strange, if you called me Edith Ulla. Bainbridge was almost a poet – his text is ‘music’ and Peter Carl somehow sounded better to him than the prosaic Karl. Ulla Tillander-Godenhielm further suggests the names of the Finnish Fabergé workmasters (Ibid., 404-5) be cited as their names are spelled on their birth certificates, with the understanding that the birth certificate lists all given names of the person. Only the names the workmasters themselves used in their marks should be cited with Fabergé objects. Thus, the workmaster Armfelt often misspelled Karl Armfeldt should be Hjalmar Armfelt, Victor Aarne should be Viktor Aarne and Anders Nevalainen should be Antti Nevalainen, etc. Hiskias Pendin – His birth certificate says Hesekil Pöntinen, but he never used that name in St. Petersburg. He and his children officially changed the name to Pendin and announced this in the official papers – workmaster mark (?) HP. Oskar Pihl – (Born in Moscow, first name spelled with “k”) 1890-1959 Junior, the former’s son, trained with his uncle Albert Holmström, worked as a designer at A. Tillander in Helsinki. Neither Oskar nor his sister Alma had marks of their own. Alma Pihl (not Anna Pihl or Phil) – The former’s sister. Her married name was Alma Klee. Konstantin Väkevä – 1860-1902 Stefan’s older son, brother of Alexander – workmaster mark K.W. Jenny Väkevä – Konstantin’s wife. Having become a widow in 1902, she had the right to mark one part of the Väkevä workshop’s production with her own mark – J.W. Henrik Wigström (not Henrik Immanuel) – workmaster mark H.W. This list with additional new research about Finnish and other workmasters/jewelers is on the Fabergé Research Site under Workmasters. Collectors of Fabergé cane and walking stick handles might find the photo essay by Umberto Barone, Vertical Art: The Enduring Beauty of Antique Canes and Walking Sticks, 2008, showcasing an anonymous collection with some Fabergé handles, of interest. The New Orleans antiques dealer, M.S. Rau, specializes in this genre. Panorama of Russia imports Russian reference, academic books and periodicals. The 20,000 titles in stock are searchable in English and Russian (Note: Searching in Cyrillic font is case-sensitive) on their website. In celebration of 20 years of service, they are offering USA website customers free media rate shipping for the rest of the year.